The three-wheeled car, which will go into mass production later this year, is based around the concept that the easiest (and arguably best) way to make an electric car affordable is to make it as light as possible. The all-electric Aptera 2e isn't about batteries, says CEO Paul Wilbur. It's about weight. The three-wheeled car, which will go into mass production later this year, is based around the concept that the easiest (and arguably best) way to make an electric car affordable is to make it as light as possible. Batteries cost quite a bit and a light car requires less energy to propel it down the road than a heavy one. At 15 miles an hour, half of a car's energy is really dedicated to shoving wind out of the way. Thus, by using advanced materials and aerodynamics, the car can reduce weight and wind resistance, lessen the need for large battery packs and come out at a lower price. Bright Automotive, which will discuss its cars in a conference call tomorrow, is taking a similar approach. The Aptera 2e has three wheels, but not because Aptera wanted something that looked like George Jetson's car. Having three wheels allowed Aptera to reduce drag far more than a four-wheeled prototype. The design takes elements from aerodynamic forms found in nature, Wilbur added. "Our aerodynamics are twice as slippery as any car on the road. The car was designed by putting two people in a wind tunnel and putting wind over them. It's the shape of the wind. That's why all the airplane jets look the same," he said. "The three wheels are all about aerodynamics. It's not about styling. It's just the most efficient shape." Practicality aside, the space-age look is part of the appeal. Like Tesla Motors, Aptera realizes that making the car cool will be a major selling point. This morning Greentech Media took a test ride in the spaceship-like vehicle on the streets of downtown San Francisco. A crowd gathered on the sidewalk as the car sat in the driveway of the Westin hotel. In traffic, other drivers gawked. Similar space-age principles can be found in the body of the car. The body is crafted from a composite with a honeycombed interior six times stronger than steel, but weighs far less. But, on the aesthetics side of things, it allows Aptera to build a curvy, swoopy car that is difficult to dent. "We'll give anybody 100 dollars if you could hit this car and get a dent," said Wilbur. Aptera will initially release an all-electric version and a serial hybrid version. In the hybrid, a gas generator will charge the car as it goes down the road. 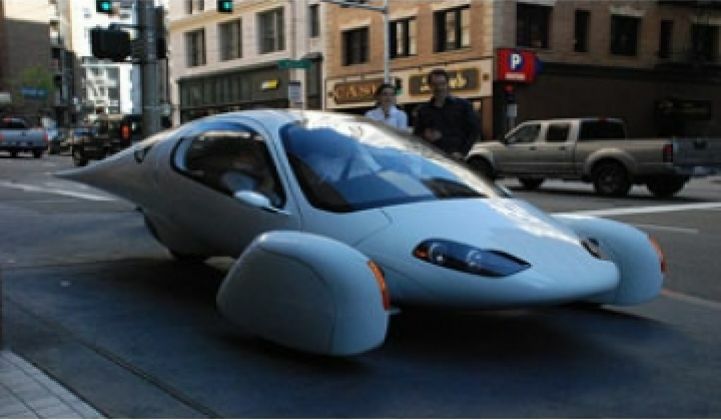 Later, Aptera also expects to have an all-gas version that will get 100 miles per gallon. Wilbur would not say what kind of lithium-ion battery that it will put in its car, but he said it will not be a lithium-cobalt battery, the kind of battery found in notebook computers. Most other car manufacturers are employing lithium-phospate or lithium-manganese batteries. Aptera's battery pack only weighs 400 pounds. The battery is lithium based and installed beneath the vehicle to keep the center of gravity low, and it also helps the three-wheeler behave like a four-wheel car. If you want one of these two seat three-wheelers they're not exactly cheap, but not outrageous either. They will be priced in the $25,000 to $40,000 range. But that is before $7,500 federal tax credits and any state credits are added. The all-electric version will go 100 miles on one charge with two people in the vehicle and 250 pounds of luggage in the trunk. You will be able to cruise down the freeway at 90 MPH, and a full charge takes about eight hours on a standard 110v socket. And chances are, you won't really notice that it only has three wheels after a while. "The fundamental driving is like driving a compact car. On the first corner you swear it's a four-wheeler," said Wilbur.